The King of Blackthorn rose to power on the strength of his sword, gaining the devotion of the people as he forged a nation and purged the ravages of war. Once a much needed beacon of strength for a foundling kingdom, he has grown old and is no longer a vital part of a now robust and powerful country. Others have risen to prominence and power within his council. Adept in their machinations and plots, the councilors have their own self serving ambitions. In a shadowy battle of subterfuge they ruthlessly vie against one another for true control of Blackthorn. In this dance of treachery, each must seize as much power as able without drawing suspicion for whispers of treason echo through the halls of the King of Blackthorn. Whispers from fellow councilors designed to implicate and see the competition shortened by a head. The King will call for the axe for any he deems a traitor and there is always the risk that he is not as ignorant of the schemes as he seems. 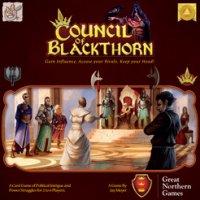 Council of Blackthorn™ is a board game for 2 to 6 players (45-90 minutes). Each player assumes the role of a member of the Council of Blackthorn. There are several different council member characters to play. Each player must build influence with the kingdom’s political factions by playing ally and building cards. Custom dice change the game conditions for each round. As players gain influence and power, they also gain hidden treason points. The players that appear to have the most power will typically gain more treason points. The player with the most treason points at the end of the game is beheaded for treason and is removed from the game. The remaining player with the most total influence points, wins the game. Add a Review for "Council of Blackthorn"